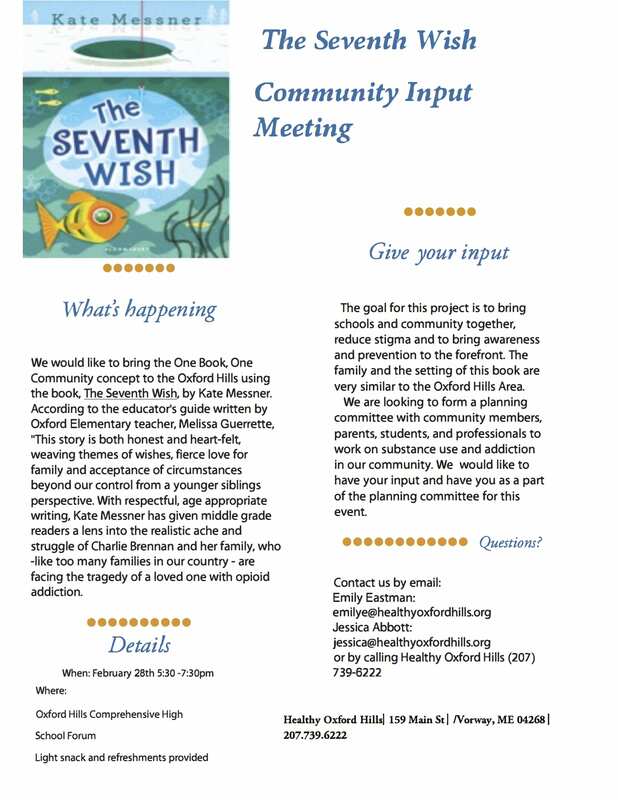 This Community Input Meeting is to discuss the idea of bringing a “One Book, One Community” project to the Oxford Hills area using the book The Seventh Wish by Kate Messner. This would involve a coordinated reading of the book in local schools and amongst local community members, along with community activities and discussion. The book is written from the perspective of a 12-year-old girl with an older sibling dealing with substance use issues. The goal of this project is to bring schools and community together, reduce stigma, and bring awareness and prevention to the forefront. This meeting will focus on planning for the project, which will be done with community input. Come join the conversation!